This Madbull Delta Ring Modification Tool is made for the ICS M4, as well as other rifles that may have a somewhat different thread on their upper receiver. The ICS M4 upper receiver barrel threads are slightly larger in diameter that other AEG's and a TM compatible barrel nut will not screw on the ICS threads, as they are not cut as deep as other standard AEG's. 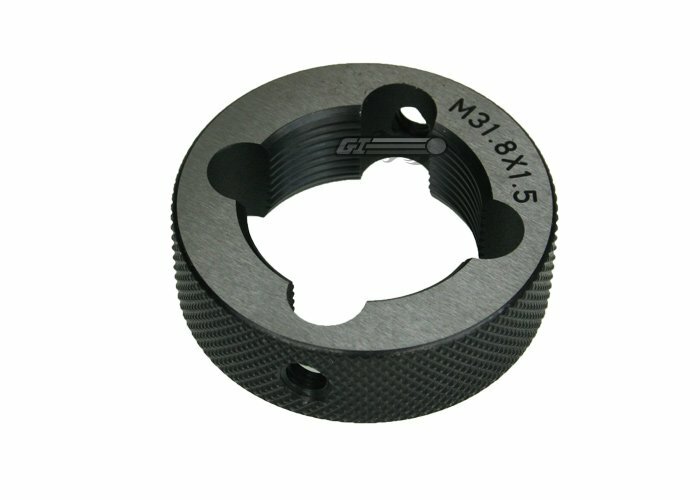 This tool is a die that allows you to cut deeper threads on your ICS M4 upper receiver, so that you can use after market parts such as the Madbull floating RIS that is sold here at ASGI. Do not use this tool if you plan on using JBU Floating RIS units or barrels, as they are made just for ICS threads and work without modification. The tool works very well and is a must if you are a fan of ICS M4's like myself. Some oil should be applied to the threads while cutting, which is normal when using any die on metal parts and it will do the job and do it well. The tool has two holes on its sides, as shown in the picture and you can install standard 1/4"x20 bolts to use as handles when cutting the new threads. I suggest you install a nut on each bolt, then install the bolt and lock each nut down to the outside of the tool so the bolt doesn't work itsway too deep during use and damage the threads on your reciever. Also, be sure to use the tool in the correct direction, as it is made to be used one way; this is descibed in the instructions that are included. If you want to use standard TM compatible aftermarket delta rings or floating RIS units(JBU is the exception), this tool is a must. I highly recommend it as an addition to your mechanics toolbox.